The Kestrel 4200 Wind-Meter makes HVAC technicians jobs even easier with automatic wet bulb temperature and humidity ratio readings. Of particular interest to dehumidification professionals, the Kestrel 4200 measures relative humidity , dewpoint , wet bulb temperature and heat stress index as well as the humidity ratio— and the patented dual chamber humidity sensor assures fast and accurate readings in any environment. This multi-functional precision instrument also measures: volume air flow, air velocity, barometric pressure, altitude, wind chill, heat stress index, temperature, relative humidity and dewpoint, either ambient or in any accessible airflow. The Kestrel 4200 Wind-Meter features a powerful data logger that records 1600 sets of measurements at user-selectable time intervals ( over 2 years of data can be recorded) . Logged data can be reviewed with the 4200' s on-screen graphing capabilities, or uploaded to a PC for in-depth review. The optional Kestrel Interface and accompanying Kestrel Communicator software makes long-term storage, in-depth analysis and detailed charting of stored data a breeze. With on-screen customization, the 4200 can truly be personalized for every technician. Easy set-up screens allow the unit to display only relevant readings, and hide screens not relative to the job. Plus the Kestrel' s user screens group pertinent information on one easily referenced screen. 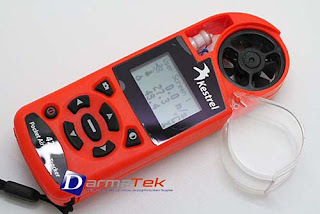 Don' t let the inexpensive price tag fool you — the Kestrel 4200 Wind-Meter is as accurate as instruments costing far more. Every Kestrel is individually calibrated to NIST-traceable standards and comes with a free Certificate of Conformity . ( Individual NIST certificates and recalibration are also available.) Consider the 4100' s hold and averaging functions, and it' s the only instrument HVAC technicians need to perform a variety of jobs.